Turn virtually any browser-based device into a digital sign instantly! Digital Signs are computer driven screens that display constantly changing images at locations where customers are making decisions or are receptive to marketing messages. Examples would be a 42 inch LCD flat screen in the lobby of a hotel displaying images of nearby restaurants or activities that would be of interest to hotel guests. Other locations could be at banks or doctors offices where customers are waiting. Retail stores, conventions centers, chambers of commerce and such are also prime locations. 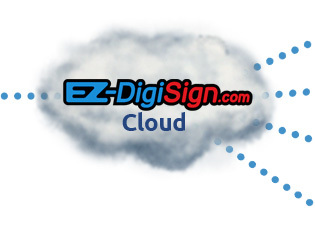 EZ-DigiSign is easy to set up and maintain because it is browser-based! It was built on the Software as a Service (SaaS) model and uses standard components. Uses standard, off the shelf hardware that is readily available on-line or at retail stores. Uses standard operating systems and web browsers. Sign Up Today and Join the Digital Signage Revolution! No Special Equipment needed! Plays on any device with an internet connection.